My new Nikon D4 is a wonderful camera. Read my hands-on first impressions. I took delivery of a Nikon D4 earlier this week, and although I’m still putting it through its paces, I figured I’d jot down some of my immediate thoughts and impressions that I’ve gotten so far. I’ll also talk about some of the new features that discriminate the D4 from the D3/D3s cameras it replaces. I’ll try to answer the burning question: Should you upgrade to the D4? When I took the camera out of the box for the first time and held it in my hand for the first time, it felt noticeably more comfortable than my D3s. I’d read about how Nikon had re-worked the camera ergonomics, with the most noticeable feature being a different placement of the shutter release. But what I felt was nice (to me at least), was the re-sculpting of the right side of the grip. That pronounced ridge on the edge of the D3 is gone, making it easier and more comfortable for me (I don’t have huge hands) to grip the camera. Of course, the new button layout and new sub-selector joysticks will take a little getting used to, but I really welcome the change. It’s much easier to select AF points in portrait mode now by just using the sub-selector joystick. The D4 also felt lighter than the D3. Yes, it is 100g lighter, but it was enough to be noticeable. The Metering Mode button is no longer on the camera prism housing; you’ll find it on the top camera dial. Also gone is the AF-area selector switch (more on this later). There are two AF-ON buttons, and the vertical grip AF-ON button has been repositioned so that it is in the same relative position regardless of camera orientation. The sub-selectors are two little mini joysticks that can be configured to control AF points and enable special functions, like viewfinder Virtual Horizon. There’s also a new Function button right by the vertical shutter release. The lighted buttons are an obvious “nice touch” to the D4 controls. If you do any kind of night photography, you’ll welcome this addition in the D4. The menus in the D4 are quite similar to those in the D3. If you have used a D3 or D300, you’ll feel right at home with the D4. The tab layout on the screen looks nicer now, with better color coding. The LCD is slightly larger (3.2″) than the D3s, but the resolution is the same. (921k dots). Images and text look sharp on the screen. One new feature in the D4 display is that you can set the brightness to values of +/- 5, and a new Auto Brightness option was added. The D4 viewfinder offers 100% frame coverage, and includes just about every readout you’ll need to use the camera without taking your eye from it. Viewfinder information is one of those “pro” camera discriminators… it won’t make you take better pictures, but it makes it easier to keep shooting during fast-paced assignments. 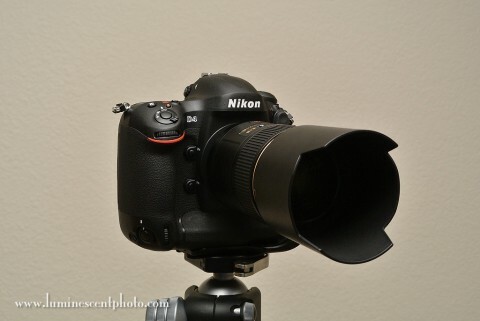 You can see my video tour of the Nikon D4 viewfinder here. One nice new feature was the way Nikon has modified the Virtual Horizon feature to use the AF points instead of the light meter. Again, this makes it easier to use the Virtual Horizon without taking your eye off your subject. The D4 uses the same Multi CAM 3500 FX phase-detection AF module as the D3s. However, the system has been enhanced. Its sensitivity is greater; the D4 can really focus in near darkness! My unscientific opinion is that the AF system felt faster on the D4. Maybe it’s my imagination, but that’s how it felt to me. The biggest improvement, AF wise, is the ability of the D4 to autofocus with lenses slower than f/5.6. This is HUGE. No, I don’t have a bunch of slow lenses lying around, but this feature should really be helpful if you use teleconverters or 3rd-party lenses with maximum apertures slower than f/5.6, like the Sigma 150-500mm f/5-6.3 DG OS HSM APO. I like to photograph wildlife, especially birds. Since most of the big telephoto lenses I use have a maximum f/4 aperture, that means I have until now had only one viable TC option, the Nikon TC-14E. While I have the TC-17EII and TC-20EIII teleconverters, neither of them were ideal on big glass like my 200-400 f/4 VR or 600mm f/4 VR Nikkors. Even though the optical performance was good, AF performance was spotty in all but the brightest conditions, and even then it was slow. I did some brief testing with my 300mm f/4 Nikkor and my 200-400mm f/4 VR Nikkor with the TC-17EII and TC-20EIII converters, and focus was responsive, even in low-contrast scenes. While I’ll still need to test this out further, this is a very promising sign. The other big AF difference is the method by which you select AF modes. The front AF switch on the D4 now only has two options: Manual (M) and Auto (AF). Nikon added a center button to the toggle switch, and you need to use this button in combination with the Main and Sub-command dials to change between servo modes and AF area patterns. In some ways, this is slightly less convenient than the previous implementation as you need to press a different button, but you can now change AF modes while looking through the viewfinder as you get a display when the AF mode button is pressed. When you change AF patterns while looking through the viewfinder, you’ll see the selected pattern of AF points highlighted in the screen. One last AF-related feature that I noticed relates to Vibration Reduction lenses. I’m a big fan of “back button” AF technique (where the shutter release does not activate focus). In previous Nikons, the AF-ON button did not activate VR on my lenses. The D4 does. That means you can track AF with the AF-ON button and not worry about having to half-press the shutter to get VR enabled. In theory, that should allow VR to stabilize better since it will have been activated the whole time. One drawback of this system, however, is that you’ll no longer be able to conserve battery by activating VR only when you want to. How much of an issue this is in practice remains to be seen. The D4 and D3s are quite similar in terms of shooting speed. The D4 can shoot 10fps with full AF and metering, while the D3s tops out at 9fps. While this doesn’t sound like much, shooting at 10 fps means that you’re capturing a frame every 0.1s, while at 9fps you get one frame every 0.11s. That can come in handy for action sport shooters. You can customize the continuous low-speed setting in the D4 in one fps increments from 1-10fps. The viewfinder blackout in the D4 is almost negligible. Even when I’m shooting at 10fps, you can still see the subject clearly. That’s a big help when tracking moving subjects. Nikon lists the D4 as having a buffer capacity of up to 98 RAW images (12-bit compressed) when using a 32GB Sony XQD Card. My buffer readout with the Sony 16GB XQD card (that was included with the camera!) reads 53 frames (RAW 14-bit lossless compressed NEFs). Either way, that’s a HUGE buffer that you’re unlikely to fill. The shutter in the D4 seems slightly quieter than that of the D3. Since I don’t have my D3 anymore, you can chalk this one up to personal opinion. Of course, the D4 includes the “quiet mode” (Q) on the top left dial that makes the camera slightly quieter by delaying the mirror drop after capture until you take your finger off the shutter release button. In fact, the live view focusing is a lot like what I get with my Nikon 1 V1! A new live view feature is totally silent capture. In this mode, the D4 actually captures video frames and saves JPEGs at up to 1920×1280 resolution (16:9 aspect). You can capture images at 24 fps in this mode when continuous high speed advance is selected! I’ll keep this section brief, as I haven’t done any empirical testing. I’ll leave that to the DXO geeks, who found that the D4 sensor bests that of the D3s and D3x in terms of overall score. The D4 produces images that are visually indistinguishable from that of the D3s, except that they are now 16 megapixels instead of 12. That means for any given print size, you won’t need to enlarge a D4 image quite as much… which should translate into slightly better noise performance in the final print size. From a practical perspective, I rarely use ISO 12,800 (the top in-spec ISO value of the D3s and D4). But I do use the ISO 1600-6400 range quite a bit when I’m photographing wildlife. Moreover, the base setting of ISO 100 on the D4 means that I should get slightly better dynamic range than if I were using Lo-1 on the D3s. If you are trying to shoot moving water with slow shutter speeds, lower ISOs are better. As I’ve been using the D4, I’ve come across a variety of new settings that I couldn’t do with the D3s. None of these things are “must haves” but they are very nice touches in my opinion. Saved AF points by orientation (custom setting a10): You can opt to have the camera switch to the last-used AF point when changing between portrait (vertical) and landscape (horizontal) orientation. If used properly, this can help you keep the AF point on your subject easier when switching between camera orientations. Take multiple images with the self-timer (custom setting c3): You can configure the D4 to take multiple images at predefined intervals when the self-timer is activated. No more running back and forth between the camera and your group shot! 2 and 3EV auto-bracketing increments: As someone who likes to shoot a lot of HDR images, this is a HUGE improvement over every previous Nikon I’ve owned (in fact, the D4 specs on Nikon’s website still shows 1EV steps). Until now, I’ve been forced to take a 5-shot exposure sequence for HDR to get a +/- 2EV range. The D4 lets me use 2 or even 3-EV increments when bracketing; up to 5 frames. That means I can capture a sequence of +/- 6EV with bracketed exposures at 10fps! New Exposure Compensation Options with flash (custom setting e4): You can now tell the camera to set exposure compensation for the entire frame (normal) or background only (new) when using a flash. I need to fully test this feature, but that’s a great idea. I wonder if Joe McNally had input on that? Dual-axis Virtual Horizon: I almost didn’t notice this at first, but the virtual horizon now operates in both the up/down and left/right axes, both on the LCD and in the viewfinder. The AF points show one axis, while the meter bar shows the other. At a list price of nearly $6000 US, the D4 is not a casual purchase, even for a pro photographer. If you are looking for a performance camera with the best build in the Nikon line, then the D4 is the hands-down choice. If you’re looking for an action camera and are not currently using a D3s, then the D4 is also your best choice; you’ll be blown away by what it can do. If you are interested in video capabilities (something I’m not), then the D4 is absolutely your best Nikon option. If you currently shoot with a D3s, your choice is a little more difficult. Because the D4 uses different batteries, a D4/D3s combination isn’t 100% ideal. Image quality between the D4 and D3s is actually quite negligible, although the added resolution of the D4 makes it a slightly better choice for landscape shooters (of course the D800 might be your answer there, especially at 1/2 the price). As a former D3s user (it was my primary camera), I think that if the handling and focus improvements are something you want/need, then the D4 is a great upgrade. If you don’t use a lot of teleconverters, or aren’t a pro who can write-off the cost of your gear from your taxes, then you might consider sticking with your D3s for a little longer. I’m very happy that I got the D4. It has enough nice new features and doesn’t compromise image quality. Pre-order a Nikon D4 from B&H and help support this site. I’m not quite sure what the intended comparison is but in the first para under Autofocus it says “The D4 uses the same Multi CAM 3500 FX phase-detection AF module as the D4.” While axiomatically true, it is probably not what you intended. Thanks for the review. Vicarious fun while waiting for my D800. Reading this now. Thanks for the getting this up so quickly! Both the Saved AF points & EC w/flash settings are very good news for me as well. I totally understand the save last AF point by orientation, that’s a super feature. I think I understand the Exp.Comp w/flash option, if it does what I think, it will be great for fine tuning fill flash exposure.. Keep it coming Jason! Thanks, Mark. Good catch. I’ve fixed the article. Great post Jason, thanks for the info! Curious – when you did your buffer fill test, do you recall about how large the files were? I ran some AFS-C tests to see how well focus tracked with a moving target. Using 14 bit lossless compressed RAW files, I could consistently rip off 83 frames before the buffer was completely full and the frame rate slowed to about 1 frame per second as it was waiting on card writes. In this test, the image files were about 19.5 MB each. Thx for getting this up fast. Since I skipped the D3S (and sold my D3) can’t wait to get mine. The 53 frames was just the frame counter. I need to actually do a full test. I also was able to confirm 83 frames when I ran the test. I have a confirmation from Mike Hagen that the D800 is limited to 1EV steps. Im glad somebody else picked up on the AF-On activating VR. I called Nikon to complain and the tech reps had no idea what I was talking about. I am not a fan of this change at all. Autofocus…VR..and Shutter Release should be 3 independent functions. This is critical. The fact that Autofocus and VR are no linked is absured. Nikon needs to come up with a solution to this. I used my D4 to shoot Chinese Opera. It gives me excellent images. too loud in the Theatre. I must find a way to reduce the noise. As I MUST use multi-shots (CL), I cannot set the dial on the top left hand to Q mode (Silent). Pls help !! !